Maybelline Hyper Glossy Electrics Eyeliner in Lazer Green reminds me of that frog which when kissed turns into a charming Prince! ^_^ You just have to give it a shot like I did and trust me, you will FALL IN LOVE. Read on to know why I love this liner so much! The Maybelline Hyperglossy Electrics Eyeliner in Lazer Green comes in a very cute triangular Color coded bottle which has an extended brush for more precision. 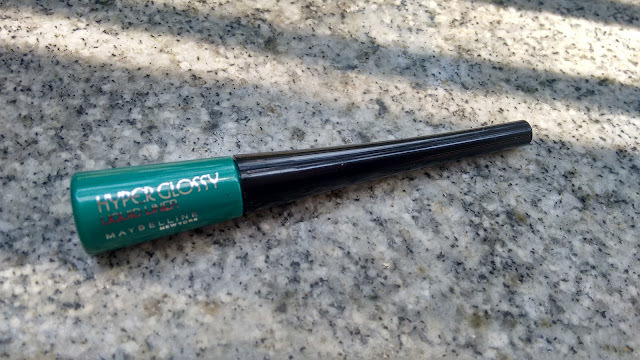 I totally adore the packaging because it's just so much easier to find and locate this eyeliner within seconds in my sea of an eyeliner stash. The packaging is pretty similar to the Maybelline Hyperglossy Liquid Liner in Black except for the colour coding. I personally love the packaging which is small, no-nonsense type and easy to carry in your purse! The elongated brush is super helpful in getting a better angle and a more precise line. I am an eyeliner person in and out, I just love love love eyeliners and if you happen to peek into my makeup collection, you will find I own more eyeliners than lipsticks, eye shadows or even blushes! I love trying out eyeliners from different brands and buy a new one whenever a new bottle fancies me. If I have to pick my absolute favourites until now then it would definitely be the Jordana semi-permanent liquid eyeliner 04 Endless Black, Lakme Absolute liquid eyeliner in black, Maybelline Hyperglossy Liquid Liner in Black , and the Maybelline Hyper Glossy Electrics Eyeliner in Gold and Lazer green (the one I am reviewing right now). This liner was my first leap into coloured eyeliners and I must say I am loving the different pops of colour on my eyes and want to buy all the shades I can get my hands on. 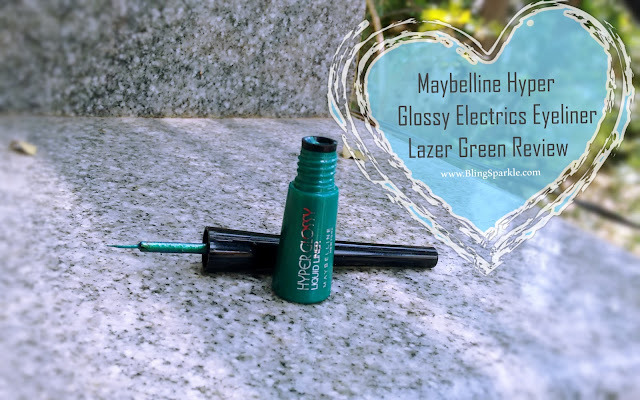 Everything from the formula, the pigmentation, the staying power - you name it and the Maybelline Hyper Glossy Electrics Eyeliner in Lazer Green has it! This is one of the best budget coloured eyeliners out there. The colour pay off and pigmentation is superb and it lasts on my eyes for 6-7 hours. It's pretty water resistant but not really waterproof and dissolves away when washed with water and smudged with fingers. The brush is very easy to work with thanks to the elongated structure and the line can be easily built from a thin outline to a mega sculpted wing. I do not have oily lids and can't say whether it transfers on oily lids but my sister who owns this too says that it does transfer a bit on her oily lids. 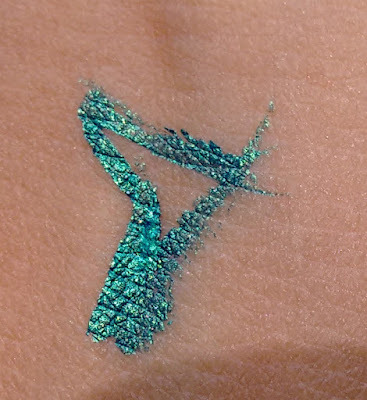 One swipe is more than enough to get an intense lazer green pigment on the eyes and tat's what I love about this eyeliner. The gold colour from the same range has a bad formula I must say and it requires atleast 3-4 swipes for the colour to show completely but that's not the case with this lazer green one. I also found that the gold eyeliner in this range has a crumbly formula which needs a little smoothing out on the eyes. The lazer green one however does not have a crumbly formula and gives intense pigmentation in just one swipe. I tried creating a heart :p That's just one swipe btw. Pros of Maybelline Hyper Glossy Electrics Eyeliner in Lazer Green"
If you love coloured eyeliners than you NEED to get this! I have the gold one from this range which is also absolutely gorgeous but has a slightly different formula. I will be buying the other three colours soon. 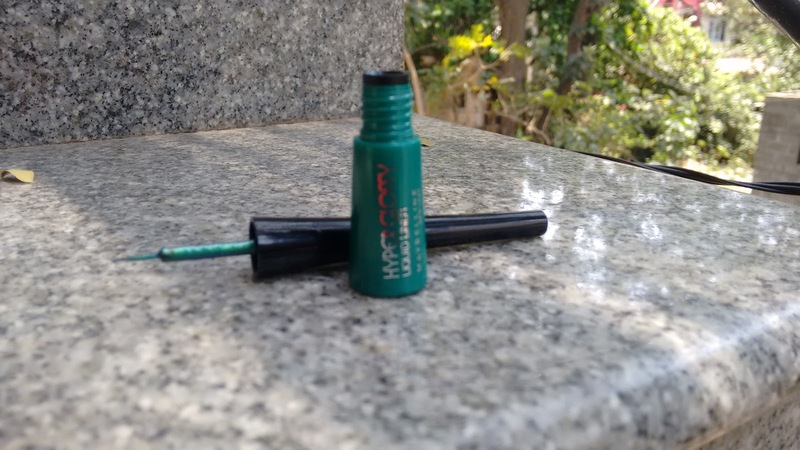 This is no doubt one of the best range of coloured eyeliners available in India!